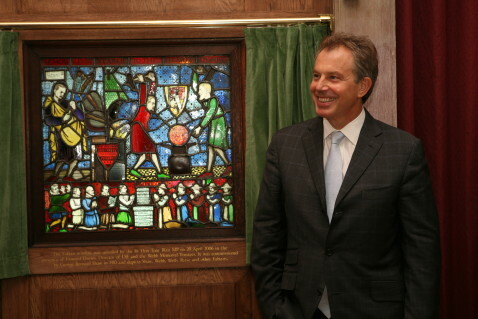 On the 20 April 2006 Tony Blair unveiled the Fabian Window, newly installed in the Shaw Library on a long term loan by the Webb Memorial Trust. In 2017 thanks to the generosity of the Webb Memorial Trust, the window became part of the School’s art collections. LSE Archivist, Sue Donnelly, writes about the window’s creation and its chequered history. 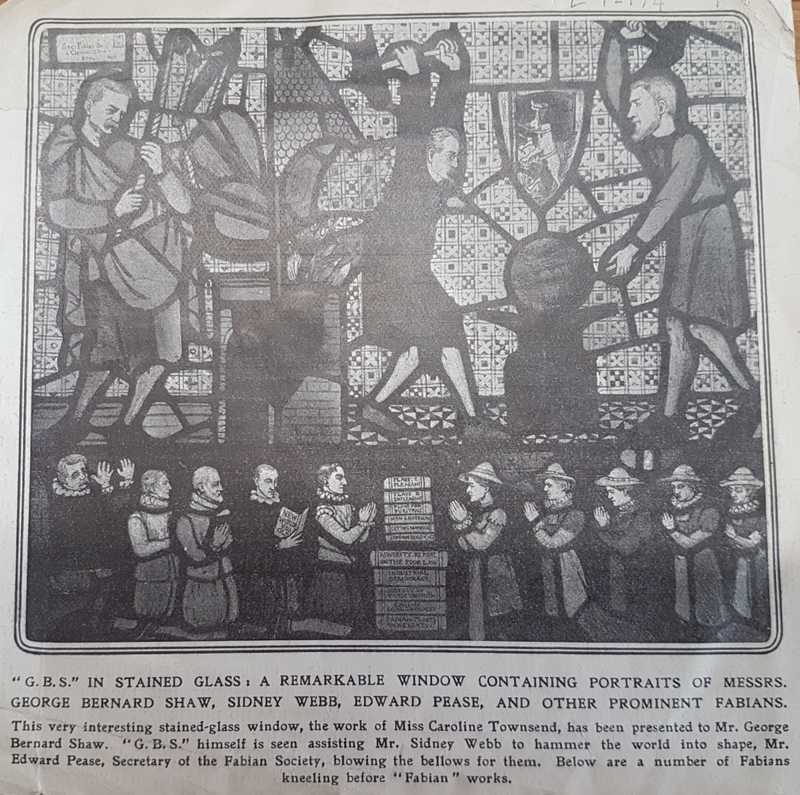 On 11 January 1911 an illustration of the Fabian Window appeared in The Sketch entitled “GBS in stained glass: a remarkable window containing portraits of Messrs George Bernard Shaw, Sidney Webb, Edward Pease and other prominent Fabians. The window “the work of Miss Caroline Townsend [sic] has been presented to Mr George Bernard Shaw”. However the background to the design and creation of the window is unclear – both Margaret Cole and Patricia Pugh include the Fabian Window in their illustrations but say nothing about its commissioning or creation in the text. Both describe the window as being ordered by Shaw and designed and executed by Caroline Townshend. A pamphlet on Beatrice Webb House, where the window was installed from 1947-1978, by John Parker, the Labour MP and Fabian Society member, follows the same wording. G Bernard Shaw is well known as a writer, Fabian Society member, close friend of Sidney and Beatrice Webb and one of the School’s founders. The artist Caroline Townshend (1878-1944) was also part of the Fabian network. Her father Chambré Corker Townshend was an architect and her mother Emily Gibson Townshend was amongst the first five students to study at Girton College. Caroline studied at Slade School of Art and the Central School of Arts and Crafts where she was a pupil of Christopher Whall (1849-1924), a leading stained glass designer. She established her own studio at The Glass House in Fulham. Caroline, like her mother, was a member of the Fabian Society and in 1912 she stood for election to Fulham Borough Council as a Fabian and Independent Labour Party candidate. In 1918 she designed a banner for the Fabian Society. She was also the sister in law of Frederick Hillersdon Keeling, an occasional teacher at LSE who is listed on the LSE war memorial. In 1920 she set up the company of Townshend and Howson with her partner Joan Howson and designed stained glass windows for churches across England and for the cathedral at Rockhampton, Queensland. The Fabian window is among her earliest works and there is some debate as to how far Shaw was involved in the design. The original cartoon for the design was given to the William Morris Meeting Rooms in Wimbledon by Joan Howson and the window is said to have been made in the Morris Works at Merton Abbey Mills. The completed window is in the style of a Tudor family memorial. At the top Sidney Webb and Shaw himself are shown hammering out a new world on an anvil beneath an emblem of a wolf in sheep’s clothing reflecting the Society’s gradualist approach. 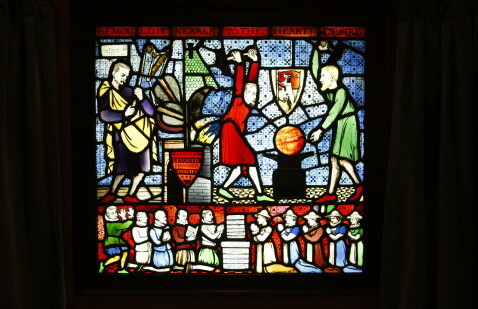 On their left the secretary of the Fabian Society, Edward Pease is working the bellows and below are the smaller figures of active members of the Fabian Society. The women are led by Maud Pember Reeves (1865-1953), founder of the Fabian Women’s Group and author of Round about a Pound a Week, who was married to the School’s third Director, William Pember Reeves. The figure at the far right is said to be Caroline herself. 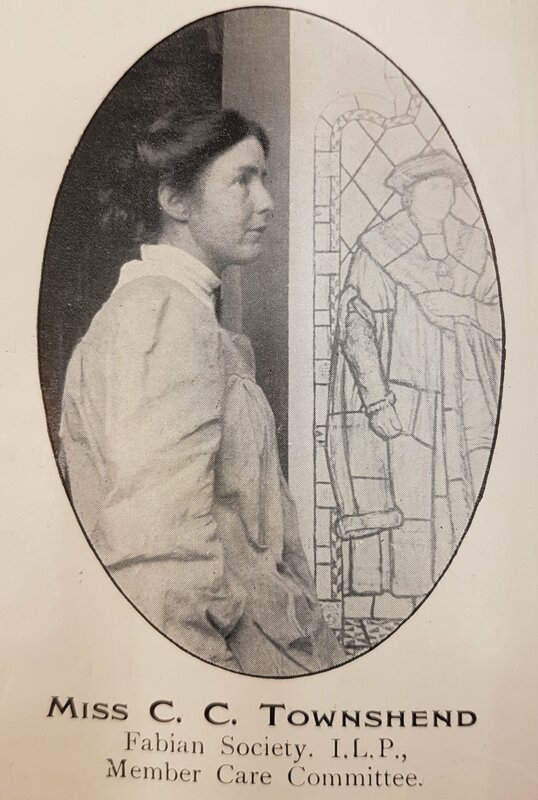 In between is Mary Hankinson (1868-1952), a gymnastics teacher claimed as the model for St Joan; Mabel Atkinson (1876-1958), who was involved in organising Fabian summer schools and later moved to South Africa; and Mrs Boyd Dawson author of a Fabian Tract on co-operative education. The men include the actor manager, Charles Charrington (1854-1926); Aylmer Maude (1858-1938), translator of Tolstoy; George Stirling Taylor (died 1939) a lawyer and member of the Executive Committee; and Frederick Lawson Dodd (1868-?) who was the instigator of the Fabian summer schools. At the far left is the writer H G Wells. He is shown cocking a snook at his former colleagues in the Society following his failure to oust the old guard, including Shaw and Webb, from their leadership of the Fabian Society. For some unknown reason the window was never collected from Caroline Townshend’s studio where it remained until her death in 1944. In 1947 the Webb Memorial Trust was established to pursue the intellectual legacy of Beatrice Webb and “‘the advancement of education and learning with respect to the history and problems of government and social policy” and it acquired the window for its conference centre, Beatrice Webb House in Surrey. Among the Trust’s first trustees were the economic historian, R H Tawney, and political scientist Harold Laski. Beatrice Webb House was opened by the Prime Minister, Clement Attlee – also a former member of LSE staff – and the window was installed in the Webb Room. Sadly in 1978 the window was stolen and disappeared from view. It reappeared briefly in Arizona, USA and then came up for sale at Sothebys in July 2005. The Webb Memorial Trust repurchased the window and placed it at LSE on a long term loan where it has been installed in the Shaw Library. The Fabian Window with its fascinating connections to the history of the School has found a long term home. In 1881 GB Shaw with his mother, Lucinda, a teacher of singing, were living in Fitzroy Street, convenient for the British Museum and a little further the theatres, notably The Royal Italian Opera House and Drury Lane etc. Next to the Opera was the Floral Hall. He must have encountered a lot of dustmen and rubbish removers. I like to see Alfred Doolittle of “Pygmalion” as a Neoliberal before his time. But he fell victim to sudden wealth and the regulation entailed. I have a candidate for the character of Eliza, another Eliza, an orphan, living with step parents not far away, actually in Houghton Street. She went on to run a respectable boarding house in Blackpool. The stepfather was a cabinet maker and I wonder if knew another of that trade nearby. It was a William Mogg, direct ancestor to Jacob Rees Mogg MP. This window has been a fascination to me since it was “rediscovered”. It certainly follows the classic form of telling a tale, a story or events in history. I wish it had been available when I was in school there–nor have I had the opportunity to visit it. I believe My great aunt Joan Howson and her partner CCT,made this window at their their studio. I am sure she helped make sure it found its way the Beatrice Webb memorial Trust. The window hung in their pottery, the Seagull Pottery for some time before the Second World War.